Here are some hints for you to get the best photo output and make the most of your Samsung Galaxy S5 camera features. The Galaxy S5 supports multiple modes within a feature called Magic Shot. With Magic Shot, you can take a photo and then apply any modes available for you to get a more enhanced photo output. You can easily apply any of these options after capturing the photo or use the Edit mode to access photo editing options for you to try on. 1. To get started, launch or open the Camera app on your Galaxy S5. When you're in the Camera screen, you should see several camera options you can apply to any of your captured photos or videos. One of these options is the Magic Shot. 2. You can switch between the front and back cameras on your phone by touching the switch camera icon (represented by a camera with a left and right arrows). When you touch the switch camera icon, Magic shot will also switch to Beauty face mode. 3. To use Magic shot, you will need to enable or turn on the feature beforehand. When you're in the Camera screen, touch the Mode icon. Next, touch the Shot & more thumbnail. Now, aim your device at the scene you want to capture, then touch the screen to focus on a specific area. If you see the focal point turns GREEN, touch the camera shutter button, to capture the selected area. The review screen will now appear. On this screen, you can see different camera mode options available for you to use or apply on your photo. Try any of these options and see how it does to your captured photo(s), then apply or use them if you like. 1. Best photo - allows you to capture eight photos and select the best one. 2. 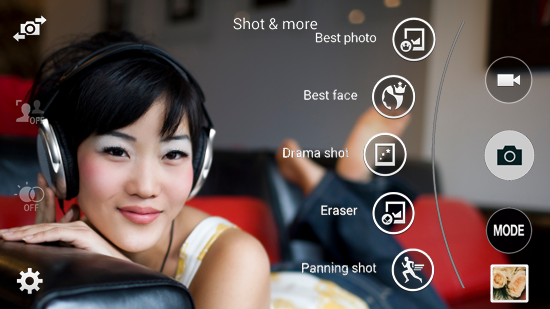 Best face - allows you to capture five photos and select the best face for each subject. 3. Drama shot - allows you to capture a series of photo of a moving subject and merge/combine them into a single photo. 4. Eraser - allows you to capture five photos of a scene and erase unwanted moving objects like passersby. 5. Panning shot - allows you to capture wide images. Typically, Eraser, Panning and Drama shots are only available when you use the back camera while Best photo and Best face when using either back or front camera of your device.